Newly crowned Australian Open champion Naomi Osaka was at Melbourne’s Brighton Beach on Sunday morning holding the Daphne Akhurst Memorial Cup in her hands, hours after defeating Petra Kvitova in three sets in the tournament’s final. Saturday’s win also meant that Osaka became the new world no.1 in the women’s tour. The 21-year-old Japanese was the first female tennis player to win two consecutive Grand Slam titles since Jennifer Capriati in 2001. Osaka won her maiden major title at the 2018 US Open. 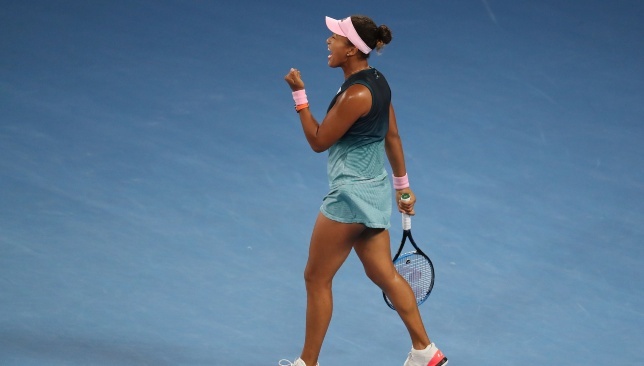 Naomi Osaka recovered from a dramatic second-set collapse to defeat Petra Kvitova and be crowned Australian Open champion and the new world number one. The 21-year-old from Japan, the first Asian man or woman to top the singles rankings, built on her maiden title at the US Open with a 7-6 (2) 5-7 6-4 victory to make it back-to-back slam successes. Judging by what will surely be the first two of many slam finals, Osaka does not do routine. But, while her victory over Serena Williams in New York was all about controversy and meltdowns, this time the drama was all on the scoreboard. At a set and 5-3 with Kvitova facing three match points, Osaka looked poised to stroll over the finish line only to lose four games in a row and the second set. She had lost her head, too, but one of the most impressive things about her this fortnight has been the way she has overcome every mental hurdle placed in front of her and so it proved again. Kvitova, who would also have become number one with victory, was playing in her first grand slam final since winning her second Wimbledon title in 2014 and only two years after the knife attack at her home that put her career in the balance. The Czech had won her last eight finals and more than played her part in a generally high-quality encounter but in the end had no answer. Osaka and Kvitova are two of the biggest hitters on the women’s tour and long rallies were scarce as both looked to unleash at the first opportunity. Osaka recovered from a second set collapse to win the title. Osaka came under pressure at 2-2 and 3-3 but saved a combined five break points, while also seeing a break point on the Kvitova serve well saved by the Czech. Somewhat strangely, the pair had never faced each other before, and Osaka’s lack of experience against top-class left-handers was one of the match-up’s unknown factors. Osaka struggled to read Kvitova’s serve initially but picked up the pace in the 12th game, forcing two set points. She could not take either, though, Kvitova producing a tremendously gutsy forehand to save the first and then a big serve on the second. However, the Czech was simply outplayed in the tie-break, Osaka powering a return onto the line for a winner on the second point and not looking back. Given Osaka had won her last 59 matches when taking the first set, the size of Kvitova’s task was clear, but the 28-year-old responded well and secured the first break of the match on her seventh chance. However, a missed opportunity to make it 3-0 looked very costly as Osaka won five of the next six games. When she won the next three points to bring up three match points, it appeared the trophy was hers. But Karolina Pliskova’s win over Serena Williams from 1-5 and match points down showed that a tennis match is never over until the final ball is hit, and this time it was her fellow Czech mounting the unlikely comeback. Osaka was struggling to hold back tears as she left the court for a bathroom break but not for no reason has she now won 60 straight matches when claiming the first set. Ending Kvitova’s run of five straight games was crucial and, when Osaka powered a backhand full of anger and frustration past Kvitova to break for 2-1, the power had shifted once more. 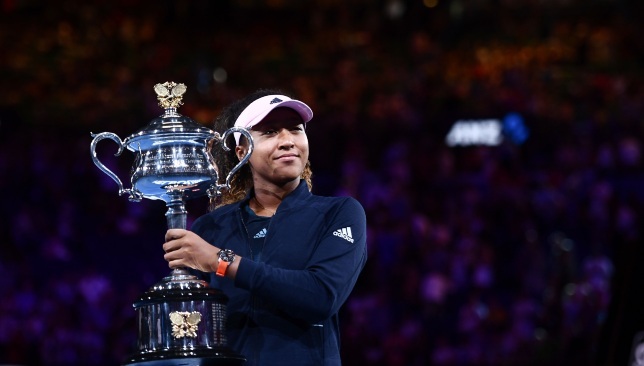 Stepping up to serve for the match for a second time, Osaka’s demons were nowhere to be seen and she clinched her fifth match point to ascend to the throne as the new queen of tennis. Rafael Nadal will hope his new aggressive approach can earn him Australian Open revenge against Novak Djokovic seven years on from their first final in Melbourne. In 2012, it was Djokovic who finally came out on top after five sets, and five hours and 53 minutes, making it the longest grand slam final in history. Both men have spent only just over double that time on court in their six matches so far this fortnight, but it has been Nadal’s uncharacteristic efficiency that has really caught the eye. The foundation is a remodelled serve that he and his team honed during the final months of last season when he was sidelined through injury. “Today I have to adapt my game to the new time and to my age,” said Nadal. “I know during 15, 16, 17 years of tennis, I’m going to lose things on my way, so I need to add new things. The new serve has allowed Nadal to pounce on opponents from the start of a rally and he has been ruthless. The Spaniard leads the tournament in terms of service games won and has not been broken since his first-round victory over James Duckworth. Coach Carlos Moya, who replaced Toni Nadal at the start of last season, has been the main driving force behind the changes, with the former world number one seeing them as essential to prolong his countryman’s career. Moya said: “Since the first day I came on board, my main goal was to convince him that he could play more aggressive. “I’ve been watching the match they played here (in 2012), six hours. I think he has to avoid that. Not only for the final but also what it takes to recover from that and the risk of injury. Nadal and Djokovic have played each other more times than any two men in the Open era, with Sunday their 53rd tour-level meeting. Djokovic leads 27-25 overall but on hard courts the statistics are even more in the Serbian’s favour. Nadal has lost eight straight matches dating back to the US Open final in 2013, while he also lost their last meeting, another titanic scrap in the Wimbledon semi-finals last summer. “Obviously it’s the most challenging match he can have,” said Moya. “Mentally he has an edge when he plays any player, but not with Novak.
.@DjokerNole on @RafaelNadal: "Nadal has historically throughout my life and career been the greatest rival that I ever played against on all the surfaces." Nadal’s form has not gone unnoticed by Djokovic, who said: “He has improved his serve. I see he has a slightly different service motion that has worked very well. “With everything he possesses, all the qualities in his game, adding to that also a lot of free points on the serve makes him much tougher to play against. 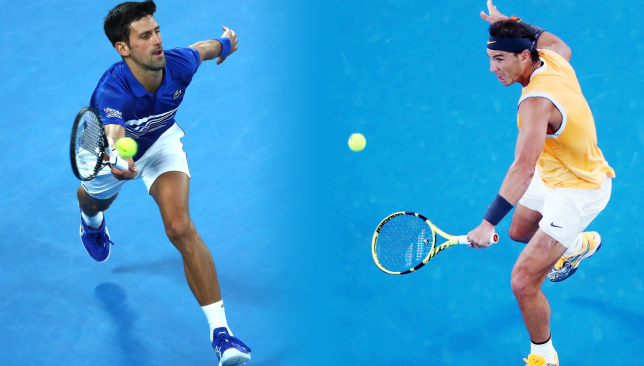 History will be on the line, with Djokovic looking to become the first man to win seven Australian Open titles and Nadal the first in the Open era, and only the third in history, to win all four slams at least twice. But for the two men, the battle of wills, strokes, lungs and heart appears to matter more than anything. “We push each other to the limit of our tennis level,” said Nadal. “I found solutions against Novak during all my career, and he found solutions against me.